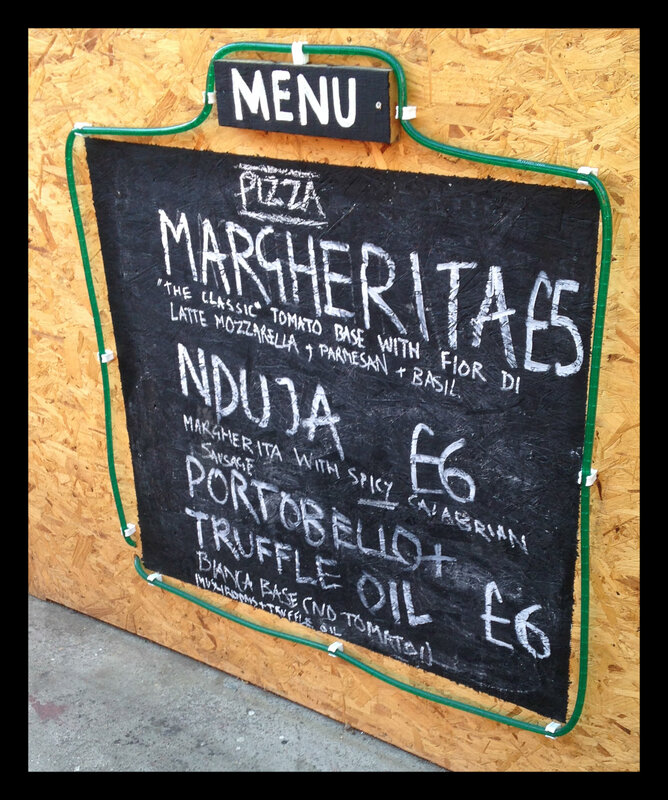 I’m practically stalking Street Feast and I have a good reason to. This is London’s most brilliant concept for foodies and non- foodies alike to embrace the pop up revolution on a Friday and Saturday evening. When it comes to the end of the week, many of us just can’t decide upon what we want for dinner. You want a curry, but you also fancy a burger, along with a pork bun, some chips, a hotdog, chicken wings. 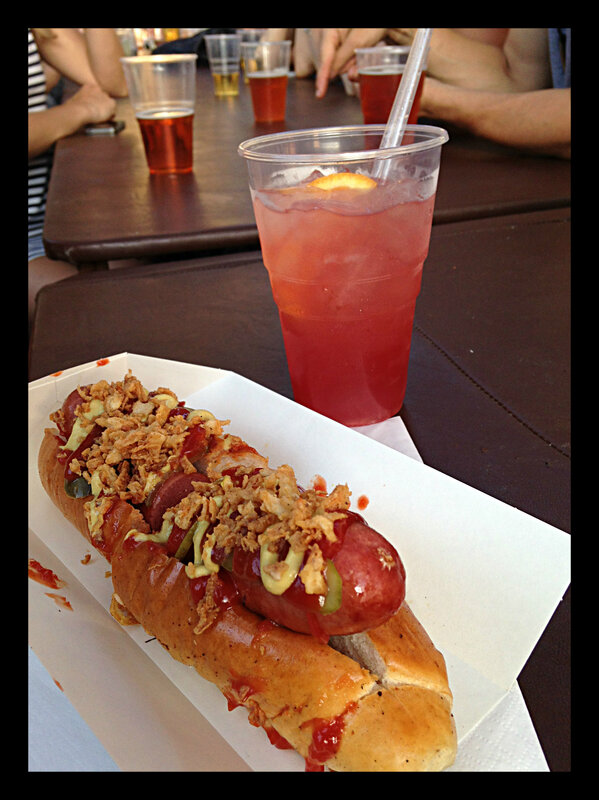 Street Feast is the answer to satisfying all your weekend cravings. 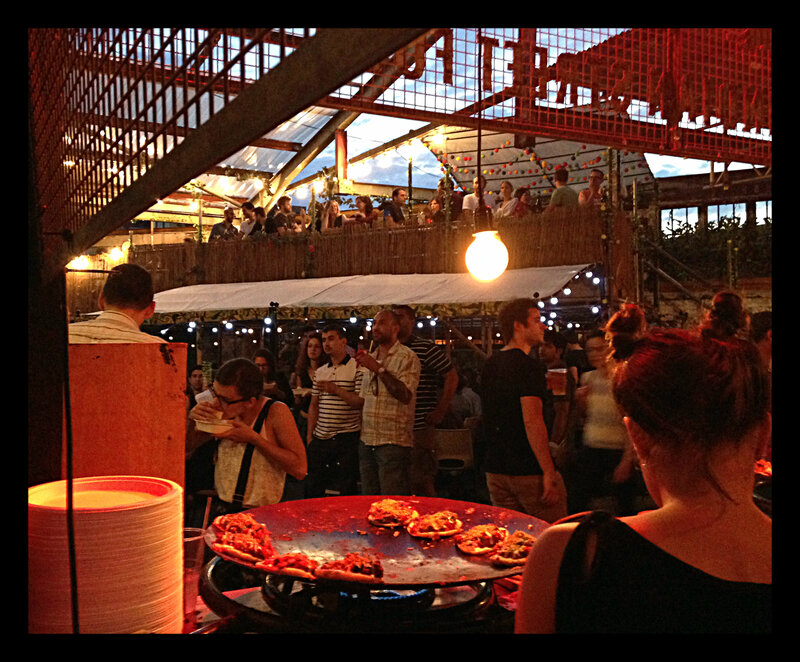 Street Feast has spread its love across London (true, it’s mainly eastside but we all know that’s where the party’s at nowadays!) in abandoned and disused areas, and has managed to keep going throughout the seasons . 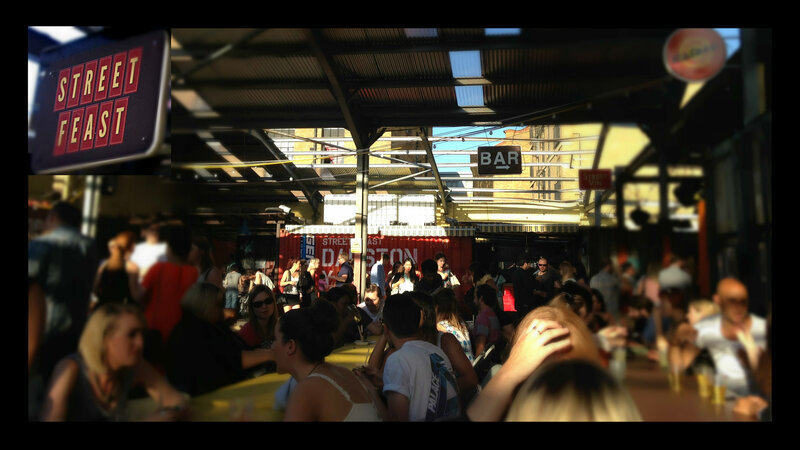 There was Truck Stop last summer (more bankers than hipsters for the 2 weeks it ran in Canary Wharf), Hawker House last winter just off Hackney Road, Fairground which combined food stalls with creative workshops and then Street Feast, now doing its second 20 week stint at Dalston Yard. 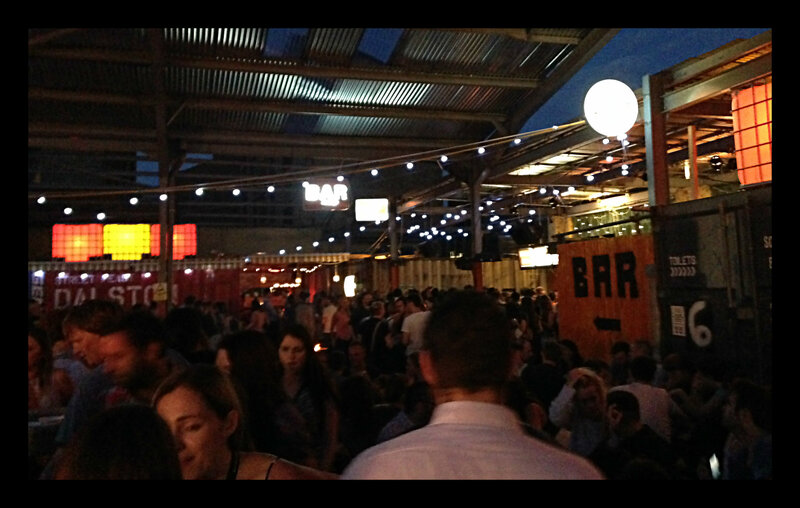 Last weekend they opened up down south (that’s South London and not south of the country) in Lewisham with Model Market, and those lucky southerners get an extra hour of fun with it being open until 1am!! Maybe southside is where the party is at…. It was only on my last visit a couple of weeks ago that I took the time out from stuffing my face to take some pictures to share with you lovely people. I know, I am too kind, but I thought it was time I encouraged you all to get down to Street Feast to chow down on the great delights on offer. 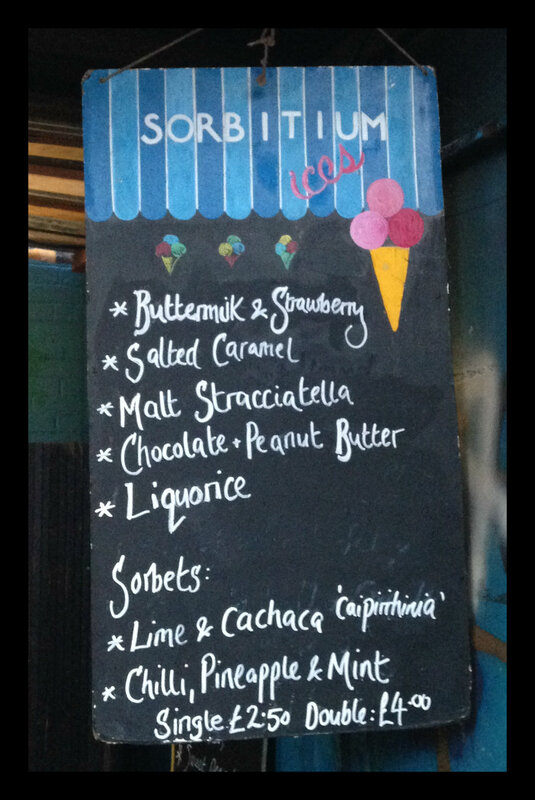 This summer, Dalston Yard has all provisions in place, come rain or shine, so there is no excuse not to swing by and dance, watch the football, grab an ice cream in the blazing heat or gnaw on a rib, sup on £10 giant festival cocktails or spy Gizzi Erskine (you can’t really miss that incredible beehive). Food, drink and dancing. My kind of place! 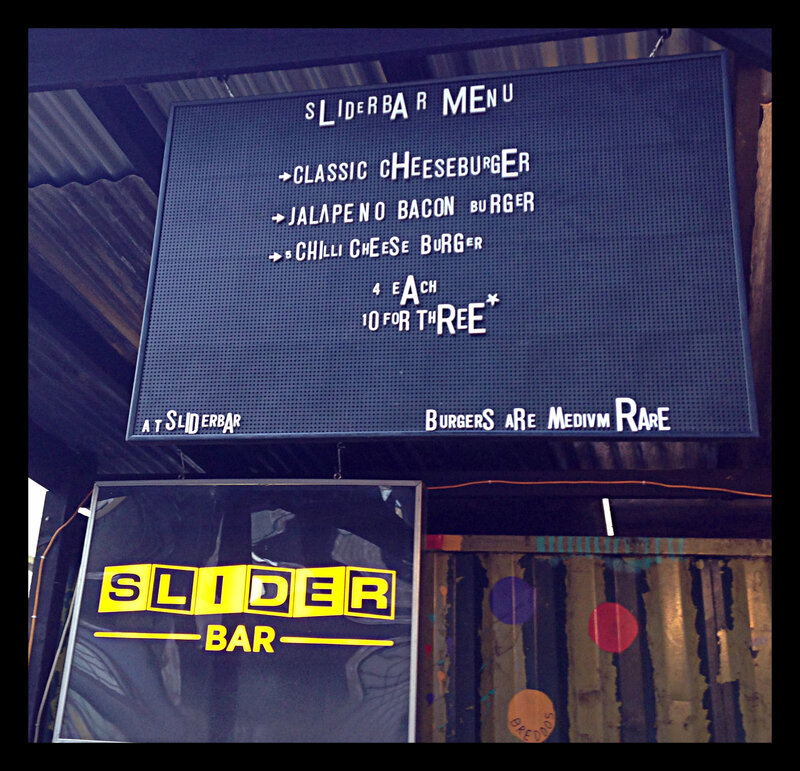 The beauty of this place is that, from one week to the next, you can go to Street Feast dreaming of the juice of a burger from Bleecker Street Burgers rolling down your chin, only to find it has now been replaced by Slider Bar (this is after you’ve lapped the room a few times). Surprised? Yes, but if I planned ahead and looked at the menu I would have known that week Bleecker Street Burgers were out and Slider Bar were in. 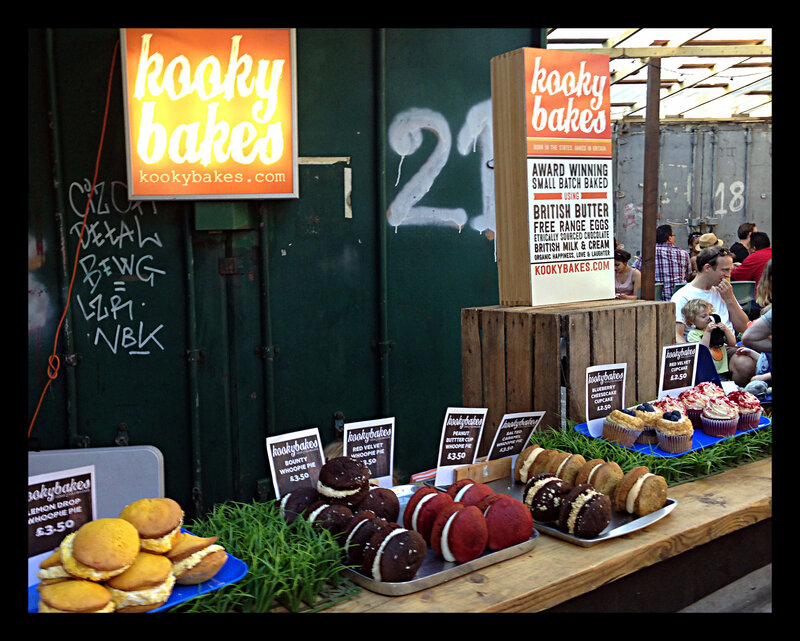 The pop ups (it’s all in the name) continually change keeping both us eaters and vendors on their toes. This makes for an exciting place you continually want to visit. Thus, my friend and I were faced with a big decision. What would we have? We wanted EVERYTHING, but we didn’t want to go too crazy, get full too fast and only manage to have food from one place. 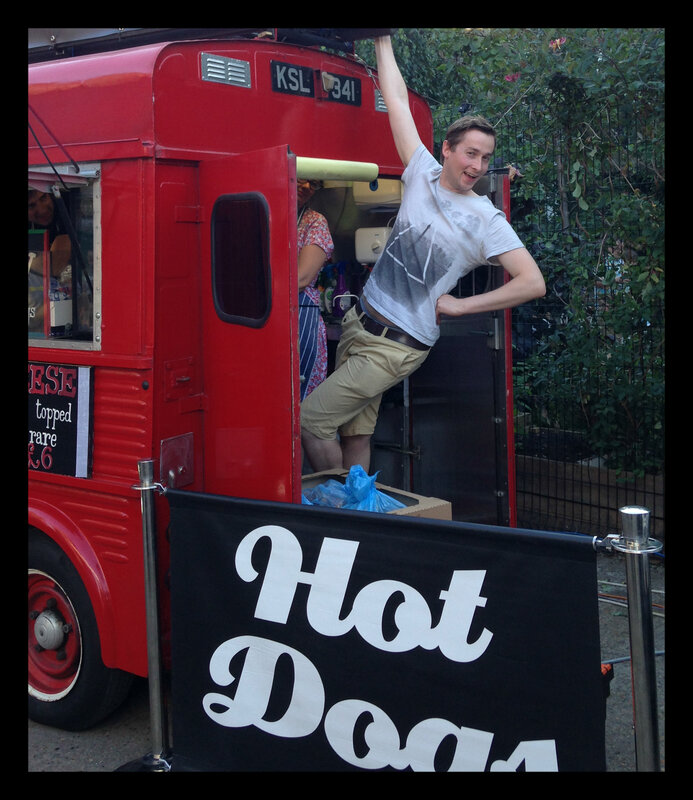 Why would you come to Street Feast and do that? We would see this as failing. As we walked in (pre 7pm it’s free to get in, post 7pm it’s a mere £3) we were already distracted by the choice of hotdogs from Engine Hot Dogs – bacon and cheese, chorizo dogs and chilli jam, jalapeno and crispy onions– and the fact that the vendor was hanging off the back of his truck to get our attention. Strike a pose. When we eventually walked into the courtyard we were engulfed in a welcoming haze of smoke that was pouring out from Smokestak which offers St. Louis ribs (I had decided I wanted them, not caring if I looked like a vulture as I got stuck in) and lemon cue chicken. One stall on, and we found ourselves at Bob’s Lobster, where the vendors were wearing white shirts, bow ties and black pinnies but seemed to be cool as you can be serving up lobster or crab rolls (half options available so you have room for lobster mac and cheese – AMAZING!). Directly opposite was Pizza Pilgrims, one of the few vendors with permanent residency, with their stone oven heating this already hot day up even more. And with that we were only about 10 metres in. There was more to discover!!! Hotbox, Breddos Tacos, French & Grace, Rola Wala, Sorbitium, Street Vin, Lickalix , Mama’s Jerk, Kooky Bakes, Rotary Cocktail, Le Bun..…I don’t think I need to continue as you can see why it was hard to decide, and it’ll mean you’ll have to check out the listings for yourself! Finally 30 minutes after arriving we had made our choices as we reminded ourselves that these places weren’t going anywhere (well not for another 12 weeks at least) and that we could return. We went with a hotdog with jalapenos and crispy onions from Engine Hot Dogs and from Slider Bar a classic hamburger, jalapeno and bacon burger and chilli cheese burger. And before you think it, remember they are sliders, so they are small. I don’t even think I need to give you the low down on any of these. The pictures say it all. EAT ME! 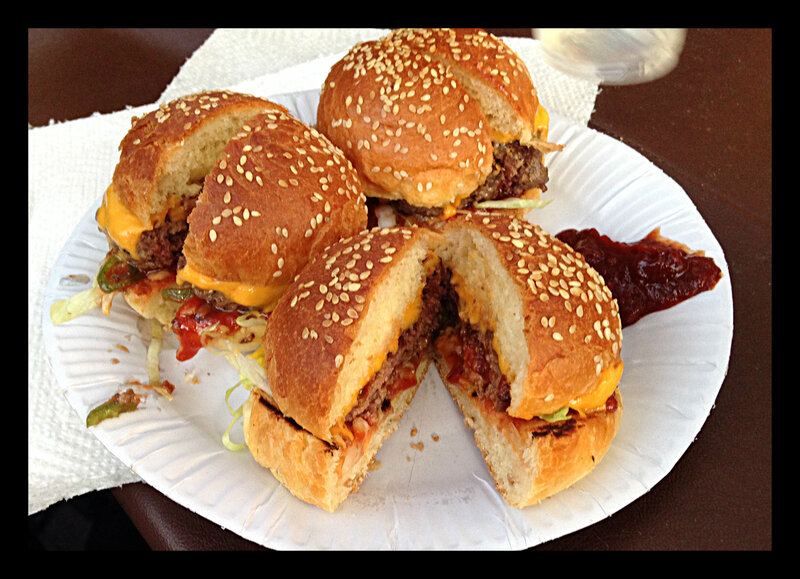 Let’s just say Bleecker Street and Slider Bar are gonna have to fight over me. Dessert time, and even though the goodies at Kooky Bakes were literally leering at us (actually we know that is not possible and we were leering at them) we opted for ice cream from Sorbitum as there is always room for something small. I was defeated after 2 spoonfuls (poor show) but my friend gobbled it down. It was super rich and sweet, in a good way, and maybe would have gone down well if I hadn’t have larded it up on the hotdog and burgers beforehand (maybe those sliders weren’t that small). Before leaving we had a little wander to check out any hidden and undiscovered spots we hadn’t spied – the truth be told we were scared that we may dive in and eat our neighbours ribs from Smokestak – and once again we passed by Rola Wala. I actually stood in the courtyard rubbing my stomach with no shame and we decided we really couldn’t consume anymore….then the spicy and tangy aromas from Rola Wala filled our nostrils. Without little hesitation my friend bought the Goan pulled pork. I had one bite and was immediately wishing I had saved some space as I wanted more, but I couldn’t. I looked on to see more and more being loaded onto the burners but I had to step aside and allow someone with space in their stomach to enjoy it. Gutted. I caught myself allowing my gaze to linger a little too long at those eating. You’d think I can never go back….but what if Rola Wala are not there next time? The beauty in all of these pop ups is that you can come across them when you least expect it and do a little dance to celebrate (I’ve be known to do that). Or you’ve just got to try and track them down (or stalk them like me. 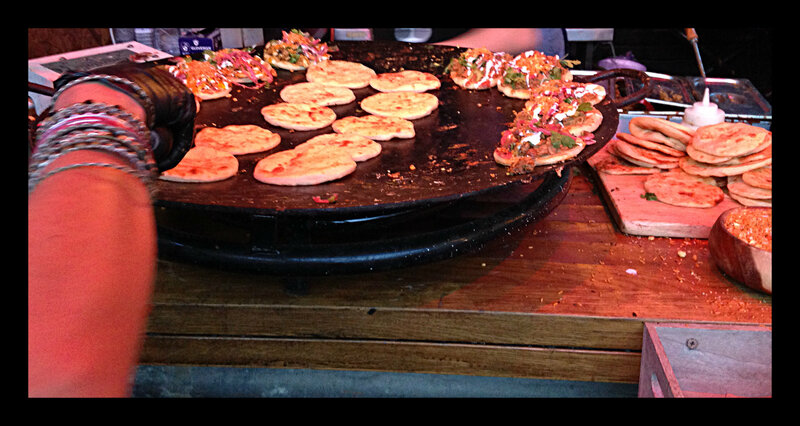 I hear Rola Wala picthed up at Glastonbury this weekend) if you can’t stop thinking about their food! I was too full to get my dance on on this occasion. Maybe next time I need to plan ahead and strategise so there is also room for dancing. 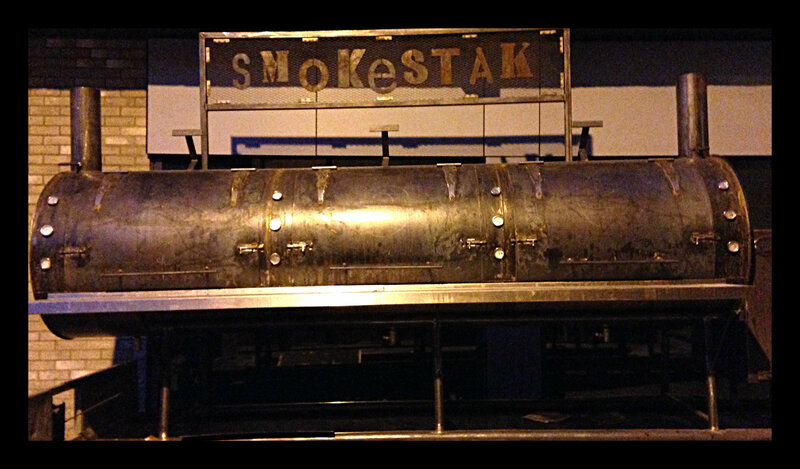 p.s Not sure how I missed this beast of a smoker on the way in. I’m definitely having the ribs next time. I need to find out how to get to Lewisham.